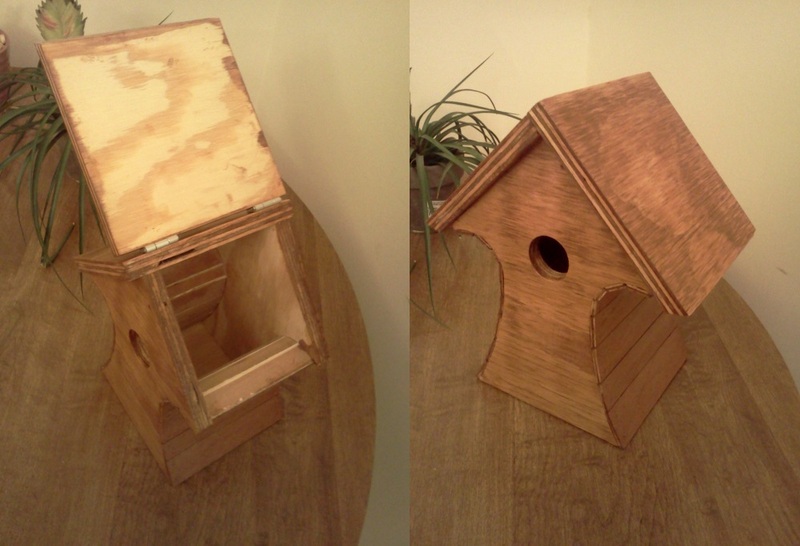 I'm no master craftsman but I do like making my own stuff from wood. It is a very rewarding hobby. I think it parallels engineering/computer programming very closely. All these things require you to thing through what it takes to make something from raw materials. These are a few of my projects from over the years. 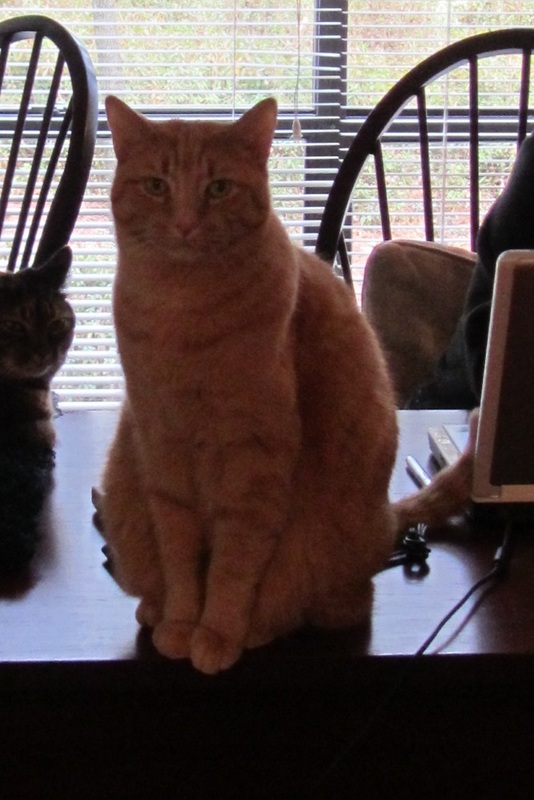 Emma's aunt and uncle, unfortunately, had Rooster, a cat of theirs, pass-away. 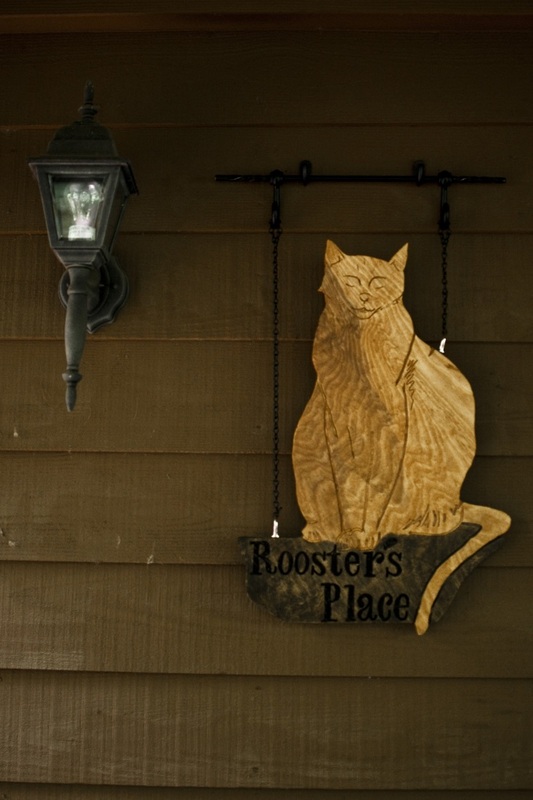 I forget how it came about but I ended up carving a silhouette of Rooster and hung it from some wrought iron accessories. 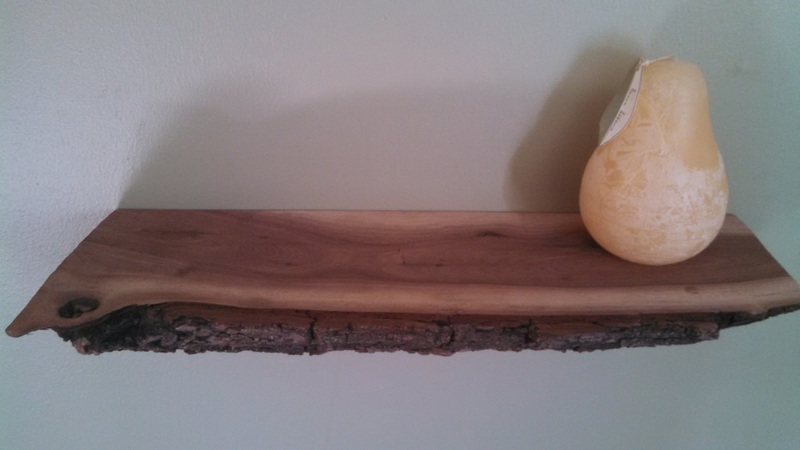 This was just a fun little project I made from the poplar wood of a previous, failed project. I glued several pieces of 1x2 poplar together. Sanded them level (I don't own a planar) and routed out a curved cavity. I made a second one to hold router bits. The hard part on this was making the jig just right. 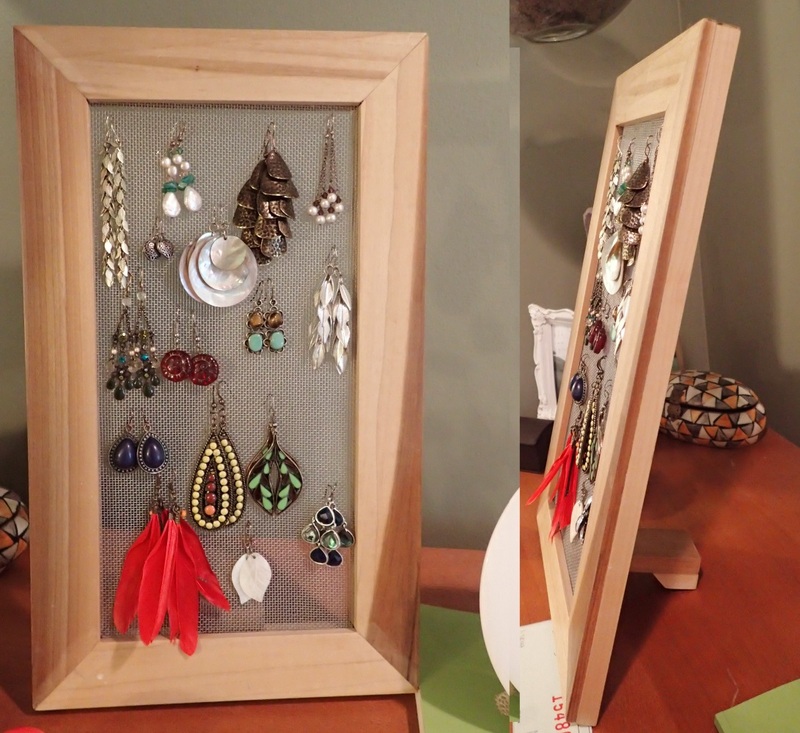 I made this earring holder for Emma when we first started dating and she's been using ever since. It is just a simple, poplar frame with some window screen glued between the two layers. There is a hinged kickstand in the back to keep it up. This was for a project when I was in high school to see who could make the lightest, strongest tower. There were min/max height restrictions and the base/top had to be specific dimensions to straddle a hole under the tower for a weight to hang and a bracket to be attached at the top. My project turned out to be pretty heavy but I had a lot of fun making it into the shape of a high voltage power line tower. It held a good amount of weight at least, I think over 140 lb. I remember it being about my weight at the time. I painted it black after the fact. 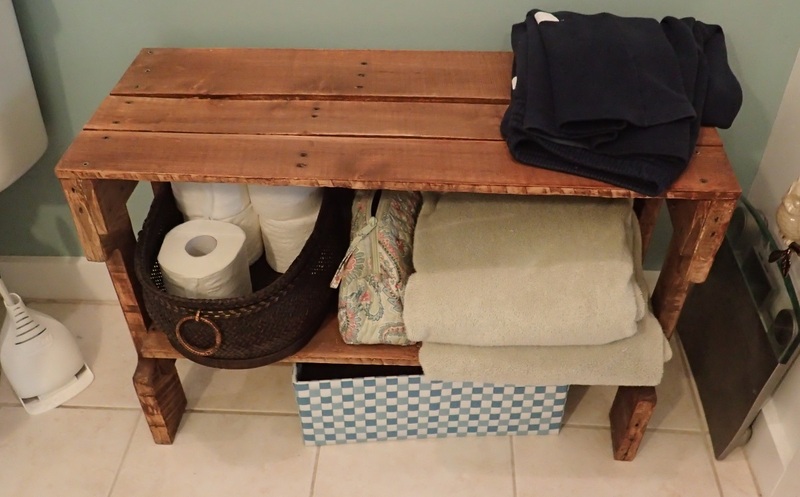 Emma and I wanted a shelf for the bathroom. We found a pallet outside the brew store, took it home, disassembled it and turned it into a shelf. It turns out pallets are put together really well and with these spiral nails. I ruined a tie rod puller trying to separate pieces of wood fasted with those suckers. Eventually I took a jig saw tot hem and the pallet was disassembled quickly. We stained this a light orangey-brown, It is very sturdy and looks pretty good in the bathroom. We had an old futon which had been peed on by a cat of ours one too many times. 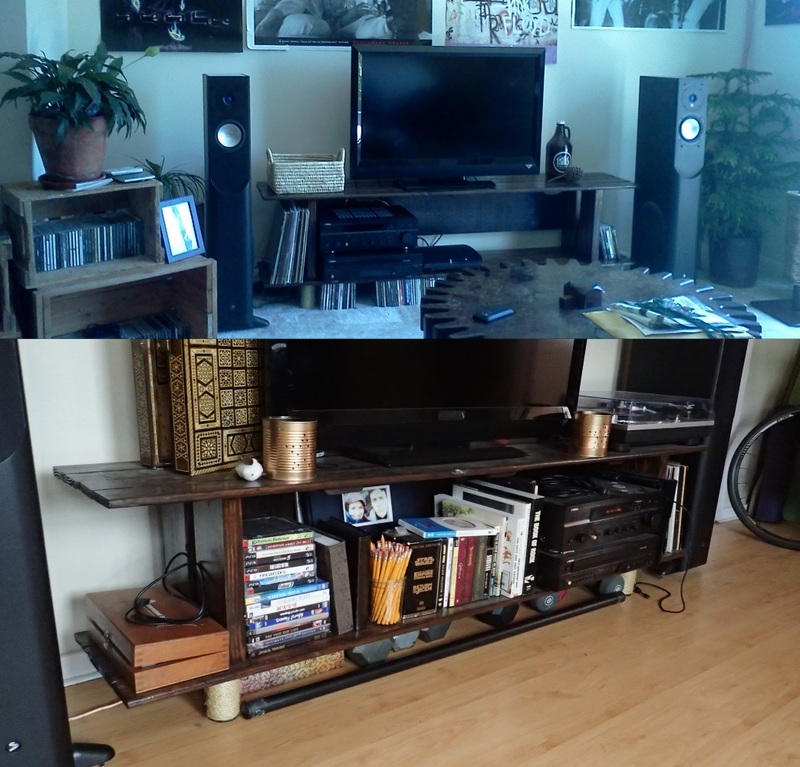 We try the futon pad away but I turned the frame into this TV/media stand. The legs are from an old IKEA desk which was also discarded in a move many moons ago. They are wrapped in sisal rope. The back piece was the only purchased wood (and you don't see it) and was only added for rigidity. 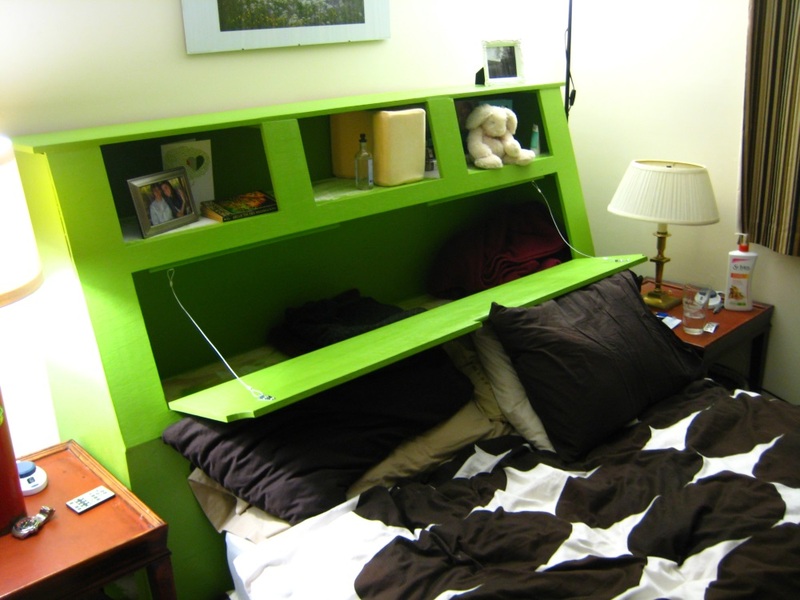 We wanted more storage space and also a sort-of bed frame. I made this headboard to sort of handle both. This has lots of storage space but is super heavy. It's awkward to carry but I made some handles at an appropriate level on the front/back, left/right. Two people can move it. The shelf linings are this cool paisley print wallpaper we found at the Scrap Exchange. The door opens and is held in place with 4 hinges on the bottom then two hinges on either side with the pins removed and replaced with 1.5 ft of metal cable crimped together in a loop at each end. Also from the Scrap Exchange, we found a long length of uncut, gold leaf, picture frame material. Emma had a cross stitch she wanted framed for her sister so I bought the it, cut it, made it square, and put an acrylic sheet in it. One of my favorites and something that gets daily use. This was my first big project with a router. This is from shop class in middle school. It broke in half once and I had to glue it back together. Since middle school I have put some finishing oil on it to seal it a bit. It is just ~20 boards glued together, planed, scroll sawed to make the wavy border, and routed to make the border round. Then the letters were drawn with a stencil and hand routed then darkened with a torch. A basic but sturdy box. Made from scrap wood. It's always important to have a compost going for the garden. A very big project. Lots of this wood was salvaged from a tree house which fell down from a co-workers fallen tree. It took about 5 weekends to make and chickens are living in it right now! Once we got tired sleeping with our mattress on the floor we figured we should get a bed frame that is elevated enough to have some storage space underneath. Because we live in such a small space these creatively chosen storage locations are very important. I made the frame from 2x3s, the legs are made from 4x8s which are lag bolted into the frame. The sides are 1x10 pine boards which are held together at the corners with pocket screws and along the bottom from the inside so all the screws are hidden. It holds the mattress snugly so the sheets stay on. This was kind of a flop in terms of looking good on a large scale. the sides are not great and by me trying to make it super minimal and making the whole thing from extra plywood it is weak. The monitor holders also are weak ans sag. Some successes are the finish is really nice. It feels great and looks good. I oiled the plywood to give it the color then rubbed on like 6 layers of polyurethane. Super smooth. The other win is that the monitors (even though the sag) are angled together which I like. This was a birthday (I think) present to my mom. I'm not sure if birds ever ended up living in it. I cut the hole to be, supposedly, the right size for typical song birds (if I remember correctly) which lived near her hour in Salt Lake City. The handyman who tends some of our landlord's other properties gave me this chunk of lovely dark maple. I sawed off one side and routed two keyhole slots into it. It slides onto the wall and sits real snug. Emma's mom made us some black-out curtains for our bedroom in NC but the windows were really wide. We could not find a rod wide enough so I bought this huge dowel, stained it and got some brackets. I made two raised bed planter boxes at our first place in Seattle. 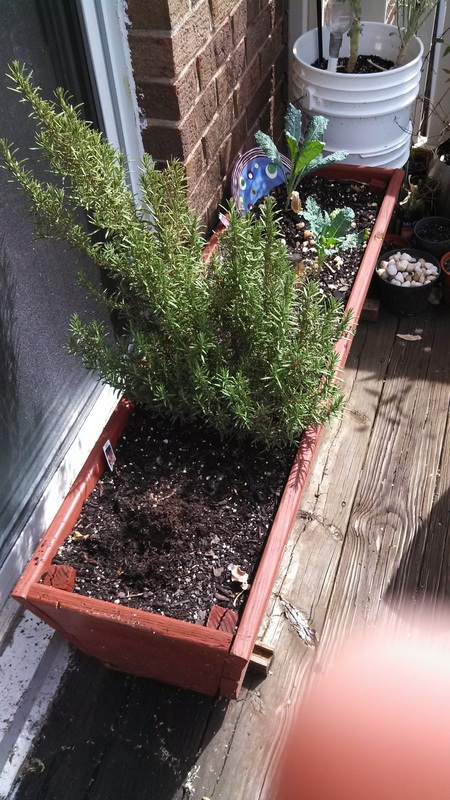 I also helped Emma's dad (in a totally separate project) make 3 raised bed planter boxes for Emma's sister. Those were made of some beautiful wood he had a friend cut from a tree that fell on his land. He brought it down all the way from PA to GA. These are projects I helped with but were not my own or I didn't have a huge role but were still fun. I helped a friend make a set of 6 sound dampers to hang on his wall. 3 were convex and 3 were concave. We put sound retarding insulation inside and stretched felty fabric over them. When I was still living at my dad's house after college graduation but before I got a job I helped him remodel my bedroom as part of a greater basement remodel project. We tore down a wall, relocated a door, hung two doors, ran new electrical, drywalled, and painted.I stained and finished the two doors we hung myself.